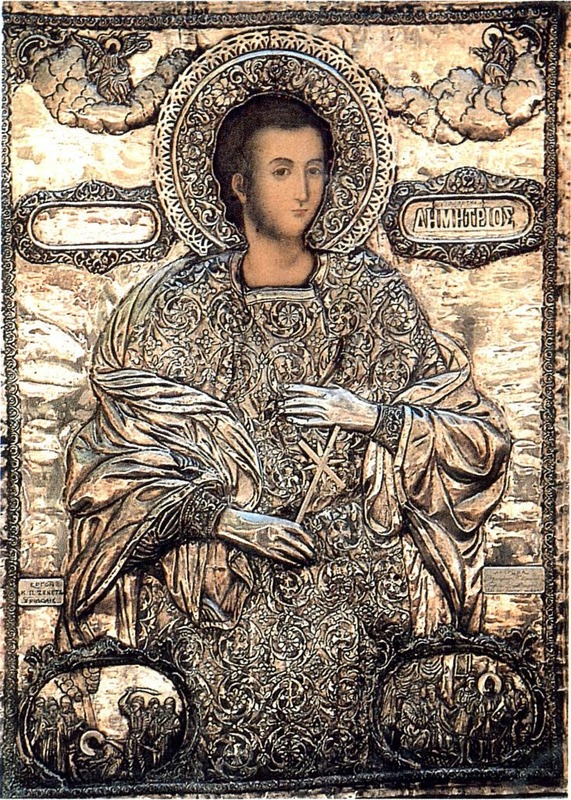 Saint Demetrios of Peloponnesos suffered martyrdom in 1803 at Tripolis of the Peloponnese. He was a native of Ligouditsa in Arcadia, and became a servant of a Turkish family at Tripolis. Yielding to their continual incitement to espouse Islam, he renounced his Christian faith. But soon he began to have strong feelings of remorse for his act. So he went to a monastery, confessed to the abbot and sought his advice. The abbot sent him, with a letter of introduction, to Saint Makarios of Corinth in Chios. Here he received very valuable spiritual training and guidance first from his spiritual father Makarios of Corinth, then from his second spiritual father Saint Nikephoros of Chios. 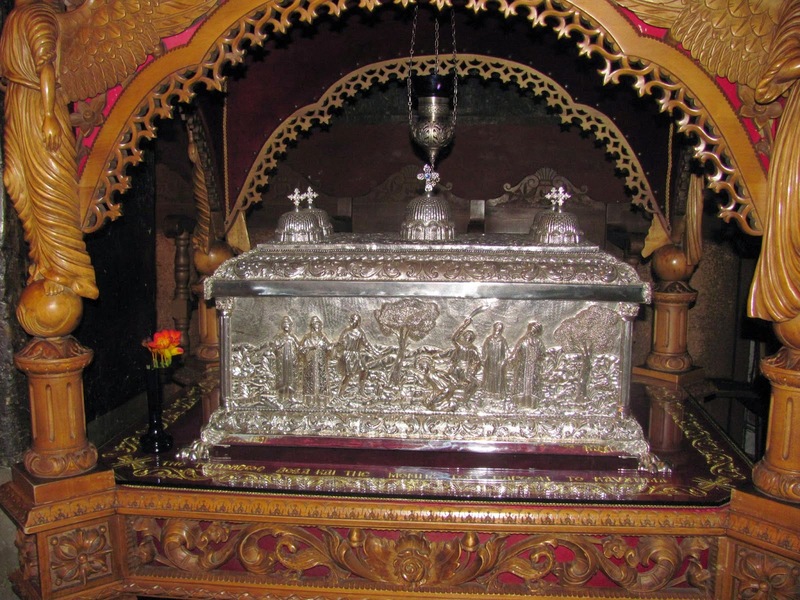 Duly prepared by them for martyrdom, Demetrios returned to Tripolis ready to profess his faith openly and to die for it. When the Turks at Tripolis saw him and heard him say that he was a Christian, they seized him, subjected him to many kinds of tortures, and finally beheaded him on the Tuesday following the Sunday of Saint Thomas, which was April 14, 1803. He is annually commemorated by the Church on the anniversary day of his martyrdom. The following account was recorded by Saint Nikephoros, where he describes events while Saint Makarios still served as the spiritual father of Saint Demetrios. 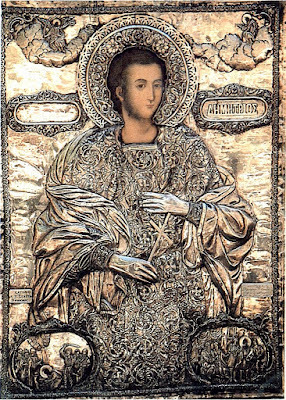 Saint Nikephoros went on to compile and publish his biography as well as compose hymns in his honor. "We observed blood flowing from his nose. We thought he was hemorrhaging on account of some accident, but indeed the blessed one was keeping the cause secret, as much as he could, wishing for God alone to know the reason. When we finally realized what was actually happening, we were exceedingly amazed. Our hearts were broken as a result, out of sympathy. This affliction upon himself was not the only one committed secretly by him. There was another self-imposed chastisement which he wanted none to discover. There was a remote outlying place, hidden from view, in these parts, at the foot of the mountain, where water streamed forth. It was a subterranean spot, a sort of excavated gallery, from which water flowed. It was in this God-fashioned colonnade that the blessed Demetrios had his sacred workshop of spiritual labors. It was at that lonely spot that he alone engaged in prayer, solely to the much-desired Christ. It was there that the ever-memorable one shed copious tears and heaved heavy sighs that he might ready himself for martyric contests. And at what time did he do this? And what did not his ardent love for Christ make him do? When did he struggle in that most chilly place? Indeed it was in wintertime, when it was excessively and unbearably cold in that spot. His testing by the frost was such that he could not endure the violent shivering. He, therefore, cut a small piece from his old covering, which he had and grudgingly put it about him for some tiny consolation. Apart from this, he looked for no other garment lest we should learn of it; for he wished his asceticism and struggles to be unapparent to us."